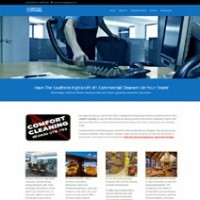 Comfort Cleaning a current client of Fat Wombat Designs nave changed the direction that their company is heading and as such requested that their website be changed to reflect this. Moving away from domestic cleaning services into commercial cleaning only, the site was rebuilt from the ground up using WordPress to give the business a more ”Corporate” image as per the owners request. Upon seeing the results, they could have been more happy. Why Choose Fat Wombat Designs? Building a website for yourself is no easy task and can seem daunting at first. It requires planning, content, graphic design skills and technical know-how to get it up and running smoothly. Here at Fat Wombat Designs, we understand that this is beyond the skills of most people so we offer a simple way to get online with an effective website that focuses on delivering your content to the whole wide world! We’ll Help You Get Online! Whether you want a personal blog, a site for your charity or organisation or a business themed website to attract customers...we can help! Based in Bundanoon in the beautiful Southern Highlands we can get your site online in just a few days and once online your site will be available to all...locally and globally. Contact us today to discuss your needs and we'll get your website up and running in no time...we can even host it for you if needed! Need to get your business or organisation online in a hurry? Contact me for help with your new website. With over 15 years of website & graphic design experience I'll have you up and running in no time at all. Forget all the bell and whistles...I make websites that are simple and to the point, but look great and deliver your message! Fat Wombat Designs - a small but effective website design business where our aim is to get you online, simply and easily.